Russia's state security service, the FSB, has accused British diplomats of spying in Moscow. It backed claims made in a Russian TV report which showed footage of what it said was British agents retrieving data from a fake rock planted on a street. The programme also said a UK diplomat made regular payments to Russian non-governmental organisations. The UK Foreign Office said it was "concerned and surprised", and denied any improper conduct with Russian NGOs. Reuters news agency quoted an unnamed FSB spokesman as saying that "everything that was shown [in the programme] was true and based on our information". The programme said four officials from the UK embassy and one Russian citizen, allegedly recruited by the British secret service, downloaded classified data from a transmitter in the rock onto palm-top computers. According to the programme, the Russian citizen was later arrested. Hidden camera footage appears to show individuals walking up to the rock. One man is caught on camera carrying it away. The programme contained a number of interviews with people claiming to be Russian intelligence officers, who made the allegations. An unnamed FSB spokesman told AFP news agency one of the accused diplomats was a 30-year-old archivist. 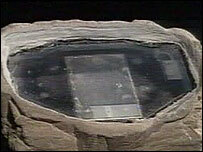 A FSB officer told Rossiya television the hi-tech stone was "absolutely new spy technology". The UK embassy in Moscow has refused to comment, but the UK Foreign Office in London issued a statement. "We are concerned and surprised at these allegations. We reject any allegation of improper conduct in our dealing with Russian NGOs," it said. The Foreign Office said it was well known that the UK government had given financial support to projects implemented by Russian NGOs in the field of human rights and civil society. "All our assistance is given openly and aims to support the development of a healthy civil society in Russia," the statement said. Russian President Vladimir Putin drew widespread criticism earlier this month when he signed a law giving authorities increased powers to monitor the activities and finances of NGOs. Critics said the measure was an attack on human rights and democracy. Michael Evans, defence editor of the UK Times newspaper, told the BBC that Russia is still regarded as a centre of espionage. "People will be a little bit surprised at the bizarre nature of this episode. I've no idea whether it's true, but clearly there is a lot of intelligence gathering that goes on." Tony Blair today dodged questions about accusations made by the Russian security service, the FSB, that British spies at the embassy in Moscow had been caught "red handed" using high-tech gadgetry to collect intelligence. The FSB has backed up the claims, first made on a television programme last night, that four spies at the British embassy in Moscow had been using a secret transmitter device hidden underneath a fake stone in a central square. The programme also said a UK diplomat made regular payments to Russian non-governmental organisations. It was alleged that they had used the hidden transmitter to communicate with a Russian MI6 agent by passing by the fake stone and downloading information onto a PDA computer. Experts on Russia and the intelligence world were today divided about how plausible the claims were. Some said the claims may be an attempt to warn the west away from helping human rights NGOs, which are currently the focus of a crackdown by the Kremlin. At his monthly press conference at Downing Street today, Mr Blair was guarded when asked about the Russian allegations. Mr Blair said: "I only saw myself on Teletext this morning the business about Russia. I'm afraid you are going to get the old stock-in-trade 'We never comment on security matters' ... except when we want to, obviously. I think the less said about that, the better." The spying row was sparked last night after Russia's state-run Rossiya television station broadcast the claims and footage of the "transmitter stone". 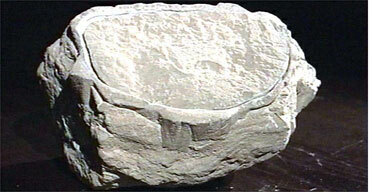 The programme said that the Russian citizen alleged to have used the stone had been arrested. Last night a spokesman for the FSB told the Guardian that the British men could not be arrested because they were diplomats. Today, an FSB spokesman expanded on the Russian claims. The ITAR-Tass news agency quoted spokesman Sergei Ignatchenko as saying: "This is the first time we literally caught them red-handed in the process of contacting their agents here and received evidence that they finance a number of non-governmental organisations." The spokesman said the situation involving the British diplomats would be resolved at a political level, which some interpreted as an indication that the Russian government could choose to expel them. Among the diplomats named by the programme were Marc Doe and Paul Crompton, who both belong to the embassy's political section. Rossiya broadcast copies of documents it said showed Britain had transferred money to NGOs working in Russia and described Mr Doe as the main contact point for NGOs. Rossiya showed a document apparently authorising a transfer of Â£23,000 to the Moscow Helsinki Group, a leading Russian human rights group which has been a persistent critic of the country's president, Vladimir Putin. Last year the head of the FSB, Nikolai Patrushev, accused the US and other foreign intelligence services of using NGOs to spy on Russia and foment political upheaval in ex-Soviet republics. Under legislation signed into law earlier this month by Mr Putin, NGOs face much tighter regulations on their financing and activities. Officials at the British embassy in Moscow and Foreign Office in London declined to comment on the claims. But in a statement last night, the FO rejected allegations that its dealings with Russian NGOs were improper. The FO said: "It is well-known that the British government has financially supported projects implemented by Russian NGOs in the field of human rights and civil society. All our assistance is given openly and aims to support the development of a healthy civil society in Russia." Some experts said today that the claims could be deliberately timed to coincide with a clampdown on NGOs. Alex Standish, editor of Jane's Intelligence Review, said the allegations should be treated with caution, but they could be accurate. "In this business nothing is unlikely. Don't dismiss anything out of hand because far more bizarre things have happened than a recording rock." Mr Standish added: "It could be a KGB staged story to put pressure on the British, or it could be completely true." Professor Richard Sakwa, professor of Russian and European politics at the University of Kent, said the allegations were "incredible". Prof Sakwa said: "There is no doubt about it, that the British, and Americans and others, have been active in the spying field, but this is extraordinary ... the fact is that, in attacking Britain, the British are just simply becoming associated as a support agency for the US. It is like they are getting at Britain purely and simply as a way of warning the US." John Hughes-Wilson, author of Puppet Masters, a secret history of intelligence, said: "The Russians are seriously concerned about Western efforts to interfere with what they see rightly or wrongly as their sphere of influence, the old Russian empire. "They are gravely concerned that the US in particular are trying to chip away at Belarus and places like Kyrgyzstan." If The Government Has Nothing To Hide, Then Why Do They Hide Everything?